If you have served in the U.S. Armed Forces or National Guard, your training, experience and/or coursework may translate to college credit. All training, experience, and coursework must first be recognized by the American Council on Education (ACE) or a regional accrediting body, such as the Higher Learning Commission (HLC), in order to be eligible to earn college credit. Want to know what military training, experience, and coursework is guaranteed to be recognized across the state? Military Transfer Assurance Guides (MTAGs) provide a statewide guarantee that certain types of military training, experience, and/or coursework align to existing college and university courses and will be awarded appropriate credit. Want to know how/what military training, experience, and coursework is recognized by institutions? MTAGs currently align with the Ohio Transfer Module (OTM), Transfer Assurance Guides (TAGs), and Career-Technical Assurance Guides (CTAGs). However, this is only a small portion of an institution’s course inventory. Through statewide training provided by the Ohio Department of Higher Education, institutions are highly encouraged to evaluate military training, experience, and coursework for potential alignment with their own courses and programs. For assistance with this process, please refer to the Ohio Values Veterans toolkit and the Train the Trainer program created by Ohio’s public institutions. The College-Level Examination Program (CLEP) provides another pathway to college-credit for military students. CLEP for Military and CLEP for Veterans provides you with the opportunity to demonstrate what you already know through examination and to earn college credit for that knowledge. 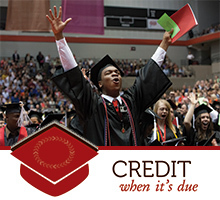 Credit is awarded based upon qualifying scores and may also be determined by the CLEP acceptance policy at each institution. DSST exams provide another option for military students. DSST exams may be available through on-base and on-campus facilities and is an approved VA National Testing Program. Funding and/or reimbursement may be available. Additional information may be found here. To find out how your military service counts toward a degree, contact the Military Credit Coordinator at the university or community college you are planning to attend. You may also use Transferology™ to see which institutions provide credit for your training, experience, and coursework. First, visit www.transferology.com. Step 5: Select the desired Course(s) by clicking on the green “+” sign under the Hours column. Be sure to select all the courses that apply to you. Step 6: On the right of the page, click on the button “Find schools that accept my coursework” to begin the matching process to find a school near you. For more information on planning and applying to college, see the Education Opportunities for Veterans page. Step1 What was your branch of service? Step3 When did you take the training? Step4 What was your skill level? Step5 What was your subject area? Step6 Which college or university do you plan to attend?